Drover of the Mighty is not desirable ramp here. // It is good to sort this deck in custom categories (land, ramp, draw, wincondition, protection, etc.) so you can see what this deck is lacking. An example: "1x Atzocan Seer #Recursion, 1x 1x Chaos Warp #Removal"
you have white cards in the deck but no sources of white mana. 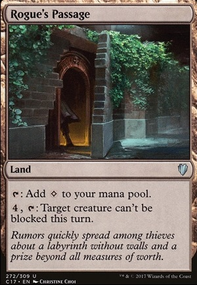 definitely need dual lands like Sacred Foundry , Stomping Ground , Temple Garden , Clifftop Retreat , Rootbound Crag , and Sunpetal Grove . you'll also want to greatly cut down on the number of expensive creatures you have, and add some in the 1-2 mana range. the best ones for dinosaurs are Otepec Huntmaster , then Drover of the Mighty . with only 5 instant-speed cards in the deck, Wilderness Reclamation provides little to no benefit. 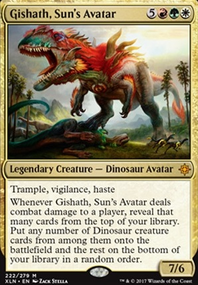 Looks like you have a pretty solid handle on deckbuilding, so I'll just give you the main suggestion I have whenever I see Gishath decks. Cut the wimpy dinos like Raptor Companion , Frenzied Raptor , etc. That critical mass of dinosaurs is good for Gishath, but you have to weigh the benefit of drawing them any other time verses getting them for free. There's a pretty big gulf between the disadvantage of drawing that Raptor Hatchling instead of a Cultivate that would get out your Gishath two turns earlier, versus the advantage of possibly getting a Hatchling in addition to a couple six-drops that will actually impact the board. The same goes for mediocre tribal stuff like Drover of the Mighty , Imperial Lancer , and Pterodon Knight . I recommend you check out the EDHREC page for Naya. You can see the general good-stuff staples that would be better than the stuff I mentioned, or you can click on Gishath, and even chose the budget tab on his page at the top right. Good luck! Hexaflexagon on I'd rather be Flying! After some playtesting, I do agree with you that Tribunal has to be cut. Most of the time, it's pretty much a Hieromancer's Cage as I don't use Convoke. I'll go with your suggestion and add my fourth Contempt and another Mortify . I'll also playtest Ixalan's Binding and Assassin's Trophy in the Mortify slot, just to mix things up and try something new. 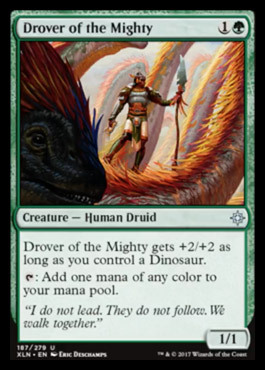 I really like Drover of the Mighty instead of anything else ( Llanowar Elves , Incubation Druid ) because I have 4 Dinos in the sideboard and the Drover can turn into a decent blocker against aggro. Also, in this deck, I really need color-fixing, and Drover helps that need. While Flower / Flourish is a great card, it doesn't actually mana ramp. It brings the land to your hand and you can only fetch a basic Forest or Plains, which is why I won't put it in the deck. I like the idea of Assassin's Trophy . What do you think (apart from Tribunal) I should take out for it? I'm not a big fan of Settle in the mainboard. There's just so little space, and it's a sideboard card for now. I really like Kaya, Orzhov Usurper as it helps exile cards for graveyards at an aggressive cost. 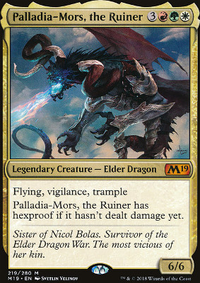 She also allows me to gain life if I exile a creature card, which might be very useful against Drakes. My meta has a lot of Drakes and Golgari, so these slots are crucial. I could take it out for Deadeye Tracker , but that kind of seems like a downgrade. 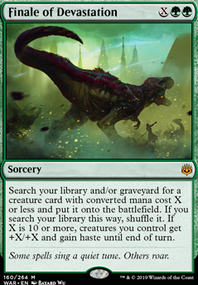 The only reason why I wouldn't take it out for Deathgorge Scavenger is because against x Midrange, I also side in the Tocatli Honor Guard , and it nullifies half of the Dinosaur's ability. Although, if I added in Scavenger, I would put my Dino number up to 5, which would mean a more likely chance at pumping up Drover. Just thinking out loud. 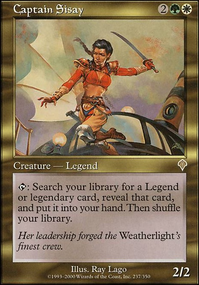 I already have Vivien Reid in the sideboard. With Duress , you mainly want to be playing it on turn 1, and I only have 6 T1 untapped lands that produce , so it kind of gets my opinions on it for this deck a little sour. The main reason I run Find / Finality is for the Find part for outvaluing the Control and the x matchups. I only occasionally use the Finality part. This is the main reason why I don't run Ritual of Soot instead. I have considered The Eldest Reborn , but I don't know where to put it. WarriorMagic on I'd rather be Flying! I don't think you will want to play Conclave Tribunal . It is a very good card, but in this deck, where you aren't flooding the battlefield, you just have a few big creatures, it feels pretty bad. I also don't know how much I like Drover of the Mighty . Maybe Flower / Flourish instead if you really want ramp. 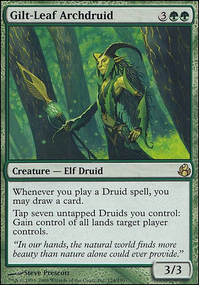 Llanowar Elves is the go to, but you only have 8 untapped green sources for turn 1 sooooo. I would cut the 4 Conclave Tribunal and add the 4th Vraska's Contempt and some copies of Mortify or Cast Down . The creatures in the maybe board don't feel very powerful, so I wouldn't play them. From the instants I would play a copy or two of Assassin's Trophy , and Settle the Wreckage in the mainboard. Settle the Wreckage is also good in the sideboard. The rest don't feel great though. (not including Mortify , that card is very good it was just referenced earlier.) From the planeswalkers in the maybe board, I don't like Kaya, Orzhov Usurper , it does next to nothing, but I would play 2 or 3 Karn, Scion of Urza , I would also add Vivien Reid . Duress , Find / Finality , and Ritual of Soot are very good, but probably Ritual of Soot is played over Find / Finality . This is because Ritual of Soot doesn't kill as much of your stuff as Find / Finality does. Lastly, The Eldest Reborn is great in sideboard and The Immortal Sun should only be played if you run few enough planes walkers to not make it a nonbo. Apart from that, it seems pretty solid. Good Luck! Hey man! Nice deck. One main suggestion, with a few others too. Have you considered splashing Green for ramp, colour fixing, and card draw? I just think that Green has some answers to the problems that you might face, such as big flyers and grindy matchups such as Control and Golgari. If you want to, I could remake this deck to have Green in it, along with a sideboard. This remake would include cards like District Guide , Incubation Druid / Drover of the Mighty and Vivien Reid if that sounds cool to you. I would swap the Angel of Grace in the mainboard with the Lyra in the sideboard. I'd take the two Adanto Vanguard s and add in 2x Shalai. This is so you can protect your guys. It also gives a mana sink late-game. Have you tried putting in a single Shalai in your sideboard instead of anything else? I think it would really helpful against decks with a high amount of removal.